These beautiful wedding invitations combine two major trends for 2018: Pantone’s 2018 Color of the Year (Ultraviolet!) and a beautiful vellum overlay! 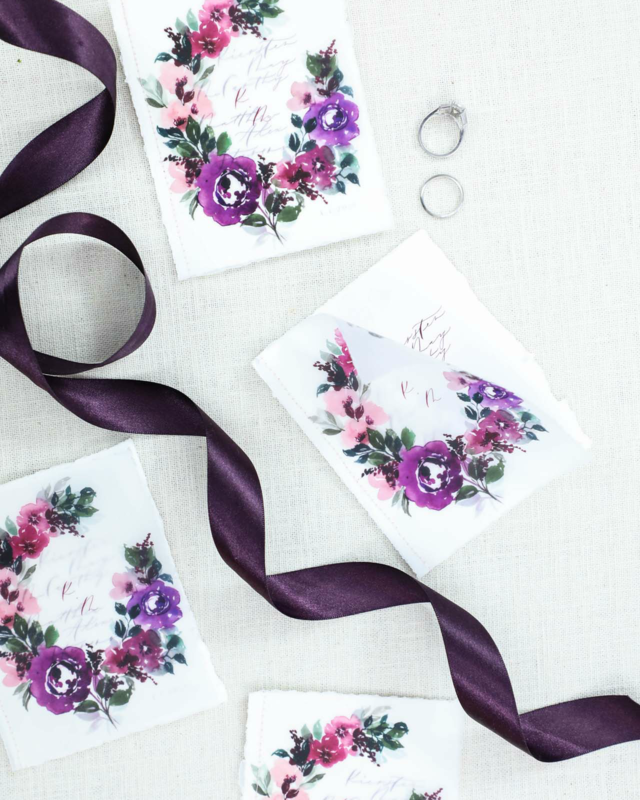 Victoria of Design House of Moira created these vibrant purple watercolor floral and calligraphy wedding invitations with intricate floral illustrations on handmade paper. And that gorgeous hand painted envelope liner! Such a fun way to bring rich color to a wonderful winter wedding. From Victoria: The bride was torn between two different design paths: a simple suite with monochromatic lettering and artwork and something more moody to reflect the winter wedding…so we did both! She wanted to keep the invitation formal, elegant, and subtle while still incorporating some of the darker tones that reminded her so much of winter. Created on Arpa paper, a Spanish handmade paper with gorgeous, soft deckling on the edges for a natural and organic look, we designed the main pieces of the suite with modern calligraphy, simple type, and line botanical artwork. To bring in the moody feeling, we created watercolor artwork in deep plums and burgundies as well as a contemporary landscape tree painting reflective of the bride and groom’s hometown and the views from the bride’s parents home, where the wedding was held. We incorporated the darker tones into the vellum overlay, envelope liners, and custom postage. The save the dates were a tri-fold design, slipped into a small envelope lined with the berry artwork and bound with a thin band of vellum printed in the floral pattern. The ceremony program design, a personal favorite of mine, consists of a vellum cover and is on a smaller scale at 3×5 inches. The booklet was stitched along the spine in pale blush thread. The entire suite was mailed with custom postage featuring two different artwork styles: one with the darker plum tones and one featuring the line botanicals used throughout the printed pieces. Each of the three envelopes in the suite featured different envelope liners: the save the date opened to the plum artwork, the reply card to the line botanical art and the main invitation featured the landscape painting in dark purple and plum hues. All of the line and watercolor artwork and modern calligraphy was created by hand for this suite by Design House of Moira.